classic addition to your tee. carefully restored and is a work of art. Coming Soon - Check back in September! 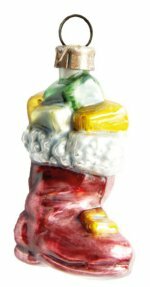 Santa's Boot is laden with wrapped packages in this ornament design. Produced from a vintage mould that has been carefully restored and is a work of art. Made in the Green Heart of Germany, the Thuringian Forest by Nostalgie-Christbaumschmuck UG 2 inches - 5,0 cm Coming Soon - Check back in September! This ornament really illustrates the face of the Moon! A long time traditional design, our Man in the Moon is a perfect vintage, classic addition to your tee. Produced from a vintage mould that has been carefully restored and is a work of art. Made in the Green Heart of Germany, the Thuringian Forest by Nostalgie-Christbaumschmuck UG 3-7/8 inches - 10,0 cm Coming Soon - Check back in September! How sweet is this little girl... she just reeks of a bi-gone era with her poise. This traditional design is a perfect vintage, classic addition to your tee. Produced from a vintage mould that has been carefully restored and is a work of art. Made in the Green Heart of Germany, the Thuringian Forest by Nostalgie-Christbaumschmuck UG 3 inches - 7,7 cm Coming Soon - Check back in September! 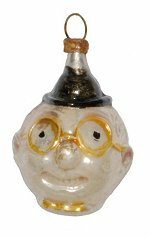 This fellow blows away on his trumpet... his blackened eyes are typical of early ornaments depicting people - simple and sweet. This traditional design is a perfect vintage, classic addition to your tee. Produced from a vintage mould that has been carefully restored and is a work of art. Made in the Green Heart of Germany, the Thuringian Forest by Nostalgie-Christbaumschmuck UG 3 inches - 7,7 cm Coming Soon - Check back in September! Clowns have historically been a strong subject for ornaments. They represent the merry, jesting nature of the German people and was inspired by the runaway inflation in Germany following World War I and the significant loss of value of the German currency at the time. This traditional design is a perfect vintage, classic addition to your tee. Produced from a vintage mould that has been carefully restored and is a work of art. Made in the Green Heart of Germany, the Thuringian Forest by Nostalgie-Christbaumschmuck UG 2-1/4 inches - 5,5 cm Coming Soon - Check back in September!